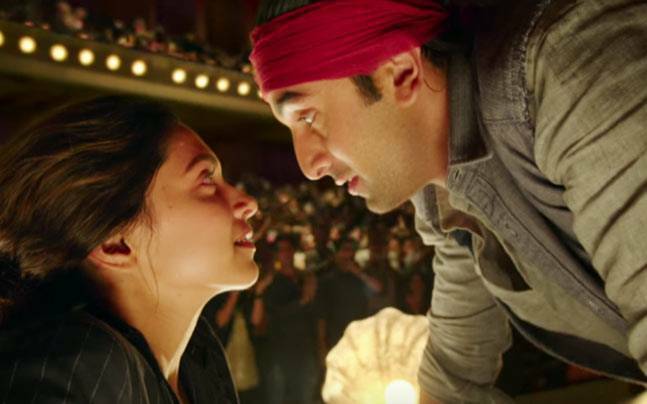 Imtiaz Ali does not create straightforward love stories, and at least from Jab We Met forward he seems just as interested in self-knowledge, identity, and personhood as in romance. Tamasha embraces this immediately from the opening framing of the story as a staged production, with the lead actors introduced in costumes that almost obscure them and dialogue that only very slowly reveals their names. When Tara (Deepika Paukone) and Ved (Ranbir Kapoor) meet, she is utterly dependent on him, but he makes it clear that he wants no information that will actually tie her to him and instead invites her to spend time together through false personas that they revel in. It's fitting that Ved insists on not learning anything about Tara for the first third or so of the film, because the character turns out to be somewhat mute and disconnected except for her reactions to Ved. She appears successful at her job but we don't hear much about it (especially from her); we see her with family after her return to India from Corsica but they're never mentioned; she seems to have no friends, unlike Ved, who has a nice gaggle of people who care about him. What we do know about Tara is that she very much loves the version of Ved that she knew on holiday in Corsica when they were both free from their daily lives and the versions of themselves that exist in those lives, and she is unhappy and incomplete when she can't have it. Aside: Another stray thought that crystalized during Tamasha is that so many contemporary Indian films use the west in such a shallow Eat Pray Love sort of way, except it's less "noble": Drink F*ck Love. This is particularly blunt in Tamasha because the two leads are even more isolated in Corsica than they are in India. Even the reason Tara goes to Corsica (Asterix comics) is only seen once again, though it may be notable that when we see her with her comic again she's clearly delighted to be re-reading it and is even adding to it with a pen (new text? notes? colors?). Europe—and a not-part-of-the-NRI-map location at that—is nothing but a way to behave in ways they wouldn't at home. What makes this holiday into non-reality work well in Tamasha is that the rest of the film indicates that Tara and Ved's holiday-selves are in fact authentic selves, and they have to find a way to integrate what at first seemed like escapism into their their regular lives in order to feel whole. Zoya Akhtar has figured this issue out too; the travel in Zindagi Na Milegi Dobara feels like a stunt, but in Dil Dhadakne Do it feels essential. I'm sure India is thoroughly sick of westerners using it for their own tales of self-discovery (I certainly am), but the pattern absolutely happens in reverse too, at least in fiction. What we see of Tara in the years between that time and the "now" of the film is her remembering Ved, existing in a lush life but obsessed with their time together. In the opening theatrical production, Tara's character on the stage, dressed as a clown in bright, floppy clothes, says something like "I'm the voice of your heart" and a bright red heart flashes on Ved's metallic, rigid robot costume, but I don't think that's actually true. He is the voice of her heart, but his heart, as we see over the second half of the film, is a sympathetic combination of career and family disappointments, tension with authority figures, and a deep love of stories. Ved is an unhappy person because he has not been able to fully address all of these features of his life—or state them clearly to other people. In the the process of figuring himself out, Ved tells Tara he can't predict his reactions even as she begs him to take her back, and I wonder if some of that tension will come out in their future. It is one thing to love somebody, but it is another to understand who they truly are. The opening of the film suggests that Ved will become a professional, successful performer; maybe the big, splashy stage lovingly absorbed by audiences will provide him with an outlet for the big, splashy emotions and reactions inside him. In retrospect, the points in his life that Ved is happiest are those when he is in some way controlling the narrative—in Corsica when he (kindly) intervenes in Tara's life and sets the rules for their interactions, as a child in Simla paying the storyteller (but notably not when he asks for a story from this same man as an adult), in school when he abandons classes, at work when he goes off the management-approved script. It takes a big disruption in his life for him to realize that he needs to synthesize all these aspects of himself, and his self-reconstruction is the heart of his story. I also wonder whether either of them will be happy into the future if he retains all narrative power. What will happen if Tara insists on being a full partner in their shared story...and what will happen to her sense of self if she doesn't? There were moments while I was watching Tamasha that I wasn't sure if it it was going to conclude in a way that I felt was genuine and kind to its characters, and it took me about a day of thinking it over to work through all of its pieces. "Between the heart and the world" is a phrase Ved uses while telling his family what he's been learning about himself; we each exist in a space that is mediated between the demands of both the very internal and the very external, and we cannot be happy until we've connected those two spheres. While I wish a comparably complex self had been written for Tara, Tamasha is a film full of humaneness towards choices, learning, and honesty. Well written, Beth. The film did leave me with some thinking to do. I know that Tara's character ought to have been better written, more complex, and yet could not help but be stunned with the depth Deepika brings to her role with her performance. That was unwritten. I have seen Tamasha ,thought of it as good in some weird kind of way while my friends criticised it.But your review pretty much sums up why i liked movie.There's the self discovery��.I feel like watching this movie again now.Thanks for this amazing very personal writeup . Batul - (Sorry I lost track of this comment for so long!) Thank you. I agree, Deepika brought far more to that role than was probably ever written out or even outlined verbally for her. Combined with Piku, I think she may be the new queen of emotionally complex modern young women. She made this person sad (maybe even depressed) without being self-centered or debilitated, loving without forgetting other aspects of her life, independent yet invested. Rohit - Thank you! I suspect many of us who have had some kind of struggle to find ourselves or have waited for someone else to figure themselves out can relate in a very personal way to this story and the way it was enacted. For me one of those moments when Ved has to lay his head on the table in the restaurant and Tara follows suit - trying so hard to relate to him even when he wants be alone and cannot really express why he feels so bad. Thank you, thank you, thank you! I'd given up finding someone who actually liked Tamasha! Especially Deepika in the film. I loved the film, messy and complicated as it is. And I liked that their relationship was as messy and complicated as it usually is, in real life, as well. Deepika is mastering her craft in leaps and bounds. When she first appeared, she was a beautiful woman, but just the standard heroine. Now, I find her full of unexpected depth; so much unspoken that is so fully expressed by the changing expressions on her face. I loved her breakdown scene in the film - so desperate, so needy, so human! Anuradha - So true! The mess is so well expressed in this film. Deepika is probably the female lead I most look forward to seeing these days (barring the rare occasion when Rani reappears).